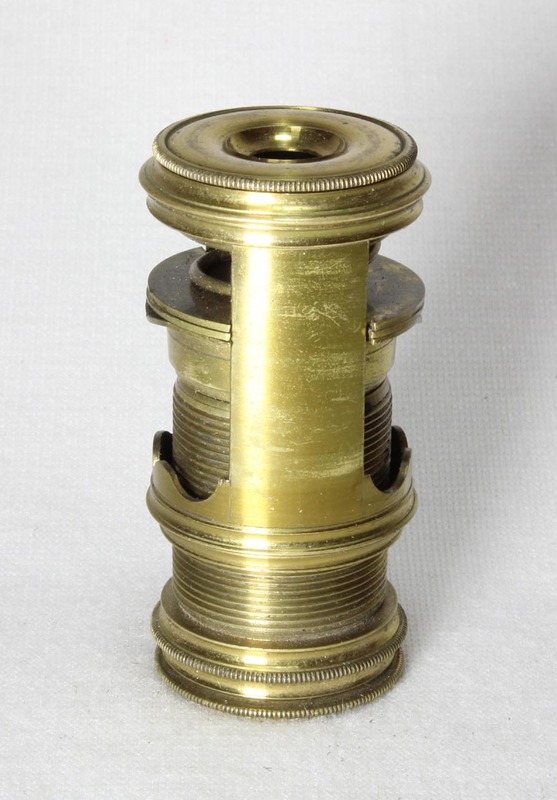 The Microscope, made of lacquered brass. 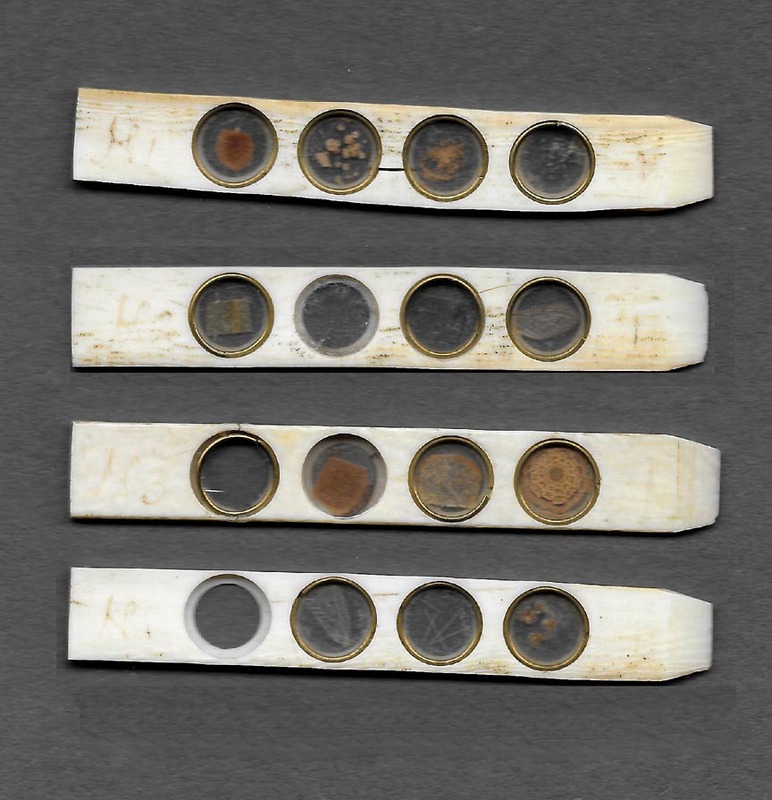 The original three eyepiece lenses, numbered 1, 2 and 3. 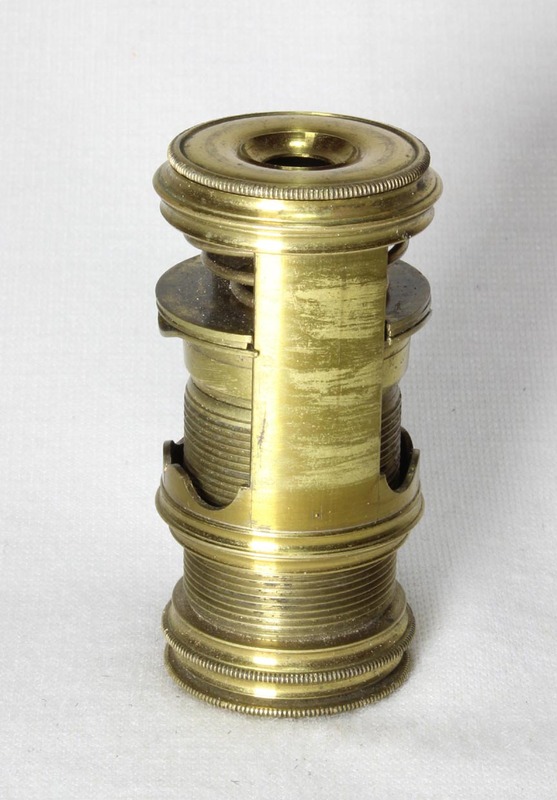 There are brass lens caps for two of the three, the third lens is stored on the microscope. 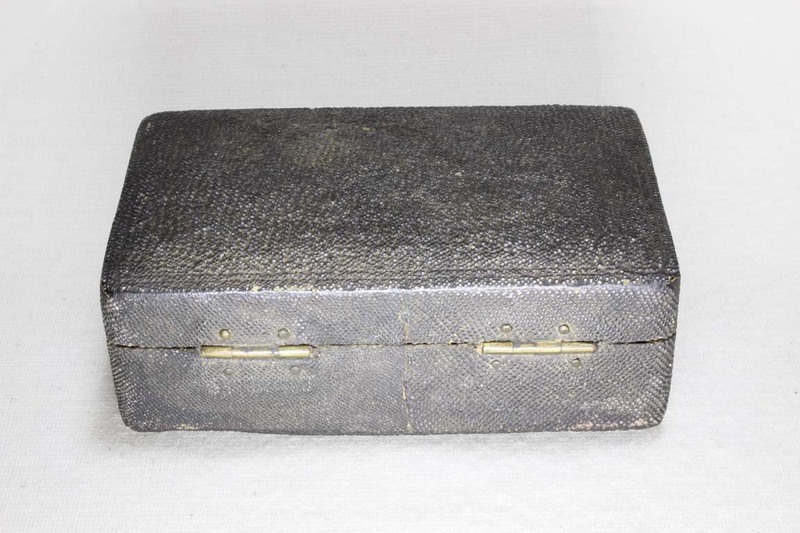 The case closes with two brass catches. The lenses are numbered 1 to 3, in decreasing order of magnification (i.e. the higher the number, the lower the magnification). The lenses are not parfocal and considerable travel in focus is needed to achieve a sharp image after changing lenses. The condenser "lens" is large, i.e. nearly the diameter of the 'screw' end, and it is screwed into the far end of the instrument. In use, the far end is turned and presses against the stage which in turn is held in place by a spring between the eyepiece and the Bonanni stage. The Bonanni stage consists of three plates, held together and around the slider or other object-holder, by the spring putting pressure on the plates from above. The sliders and the live box slide have a tapered end which makes it easier to insert them between the upper two plates of the stage. The upper two stage plates each have a partial opening on the sides between them to facilitate insertion of the sliders. A glass vial can be inserted between the lower two plates to examine the circulation of a (e.g.) a newt. There is a V-shaped bend in the center of the bottom plate to prevent the vial from moving during observations. The microscope measures about one inch in diameter and two inches in length when in the usable focused position for an observation; it is about one and three-quarters inches long when the barrel is screwed into to its maximal depth, moving the slider closest to the eyepiece. The live box slider, or 'wet-cell' slide, consists of three parts. The outer casing holds the other two parts together and has a tapered end to make inserting it in the sprung stage easier. There are three concave glass wells. 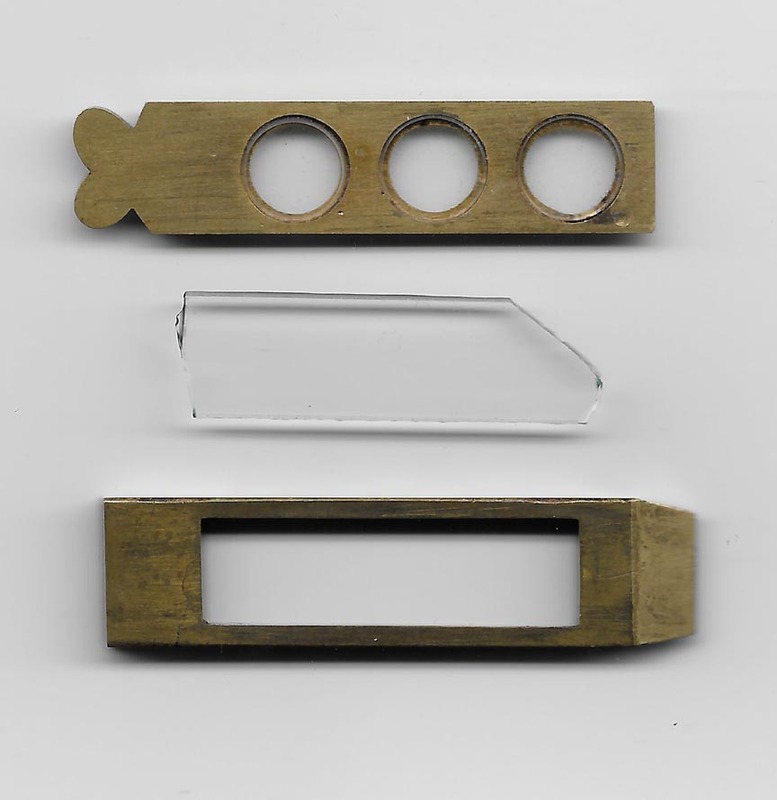 Liquid samples of pond water, for example, would be placed in these, covered with the other piece of glass and the two inserted together into the outer brass casing. The outer casing holds the other two together well. Although the cover glass appears irregular, it is still large enough to cover all three wells at once. 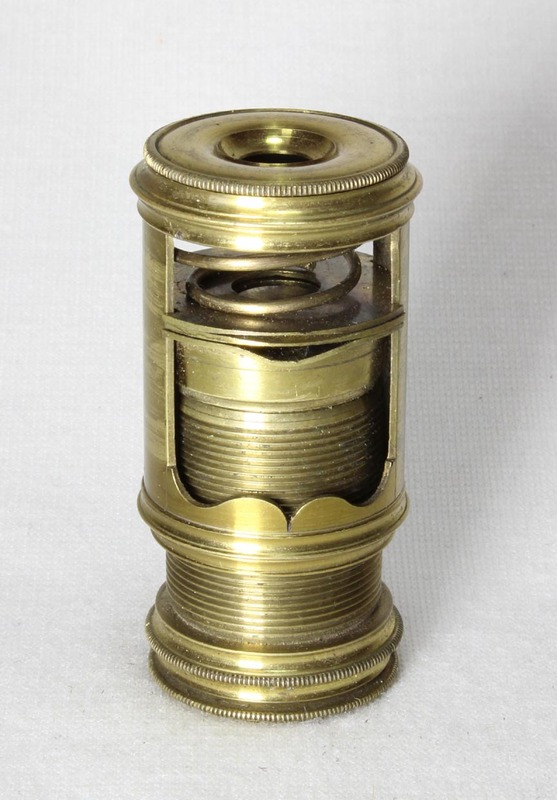 Cuff then went on to describe his compass microscope with Lieberkuhns for viewing opaque objects; unlike other makers who made attachments for the Screwbarrel for use with opaque objects (as shown in the last paragraph of this web page), Cuff stuck with the Lieberkuhn-equipped compass microscope for this purpose. This makes some sense for high powers where the use of an ordinary lens will not work satisfactorily. 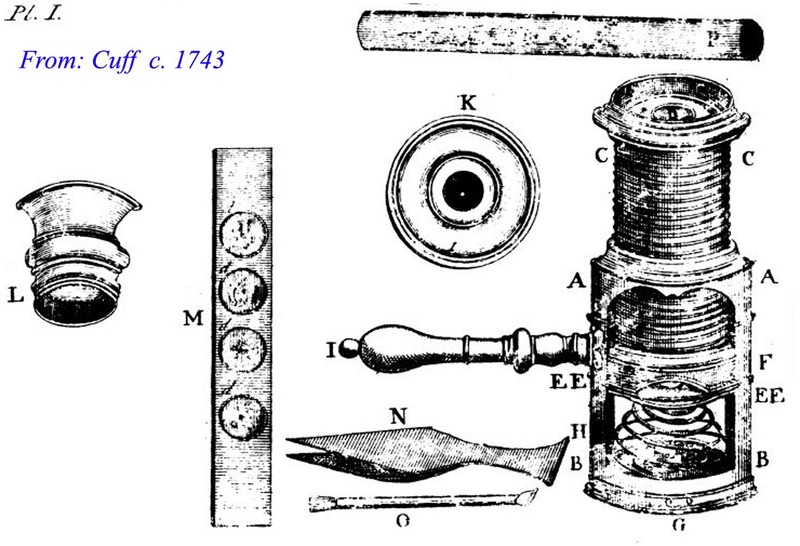 Cuff started to make Lieberkuhn-fitted microscopes about 1738. When I first obtained this instrument, and for some years afterwards, I thought this was likely the smallest example of a screwbarrel microscope. Although small, and certainly smaller than the ones with provision for a handle, it is not the smallest. Through the kindness of some fellow collectors, I am able to provide the reader with a visual comparison. This would then make mine, despite being quite small, about 'mid-sized' when it comes to known examples of screwbarrel microscopes. The example second from the left has a blackened-ivory shade over the condenser end to prevent oblique light from entering. 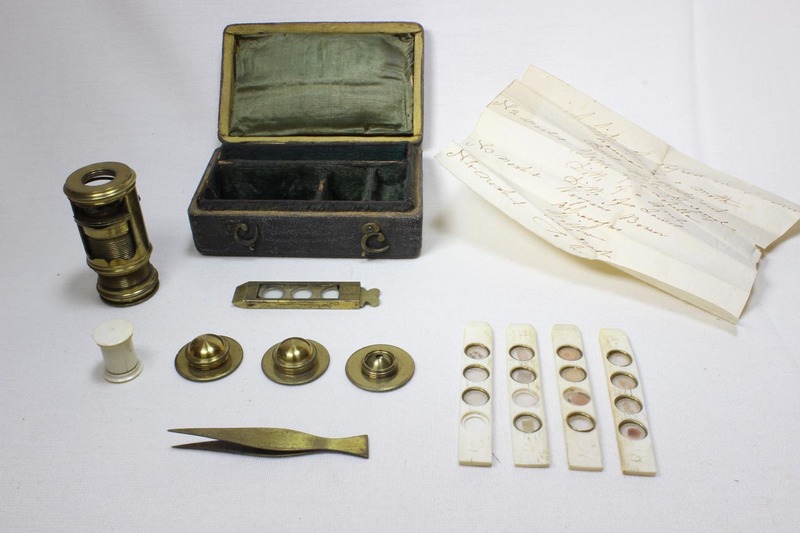 Interestingly, even that little example that is second from the left still came with a full complement of accessories including glass vials and an offset attachment for viewing opaque objects. 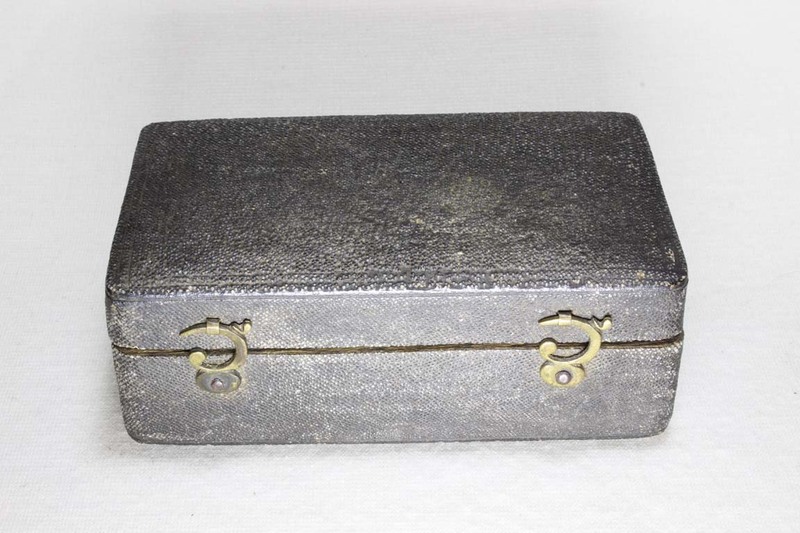 For more about this type of offset accessory, see the last paragraph and engraving at the bottom of this web page. 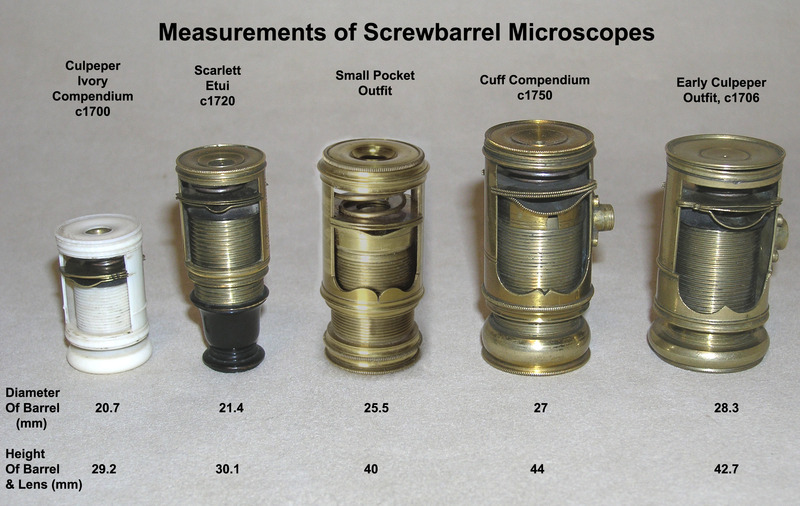 The screwbarrel microscope has some features that can be traced back to prior makers. 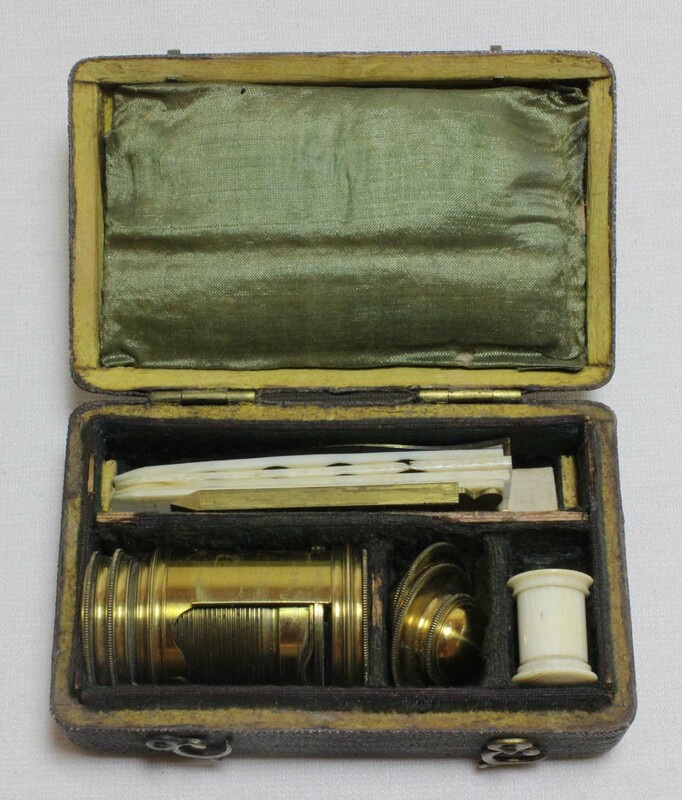 Use of the screw focusing mechanism for the main body of the microscope was used in compound instruments of the 17th century including the Italians Divini and Campani(left) (mid-1600's onward) and even John Yarwell of England in the late 1600's. 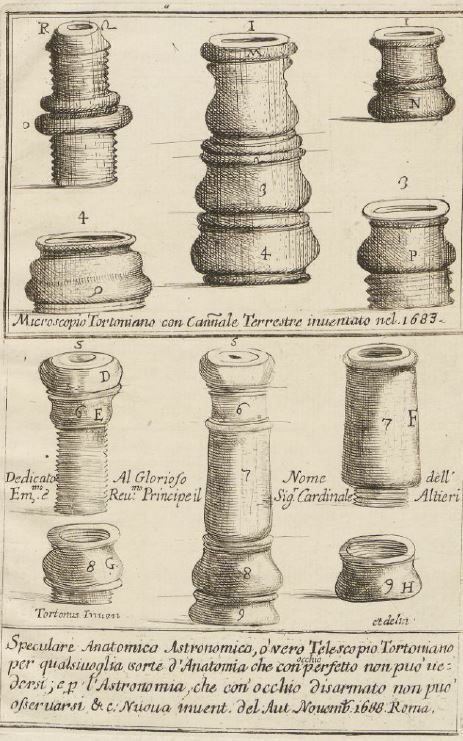 A compound form of portable handheld screwbarrel microscope was first invented by Carlos Tortoni (Tortona, Tortonus) of Italy, announcing this in 1685; his original drawings are shown to the right. According to Clay & Court, Tortoni first described his microscope at a meeting of the Accademia Physico-Mathematica held in the house of Lord Camp (sic Ciampini) at Rome on August 5, 1685. According to Clay and Court, the tube was 2 inches long. It was composed of five parts, each joined by a screw to the succeeding part, and it could be divided into a microscope and an eyeglass; this was illustrated in his instructions for the use of the instrument: Instruzione delle Due Sorti di Microscopi Tortoniani Nuovamente Inventati e dati in luce (image of his illustration shown to the right). Tortoni's (Tortona's) account is also in Acta Eruditorum (1685 p478) and in other publications. (Also see: History of the Microscope, by Clay and Court 1932, reprinted by the Holland Press in 1975 p. 41). 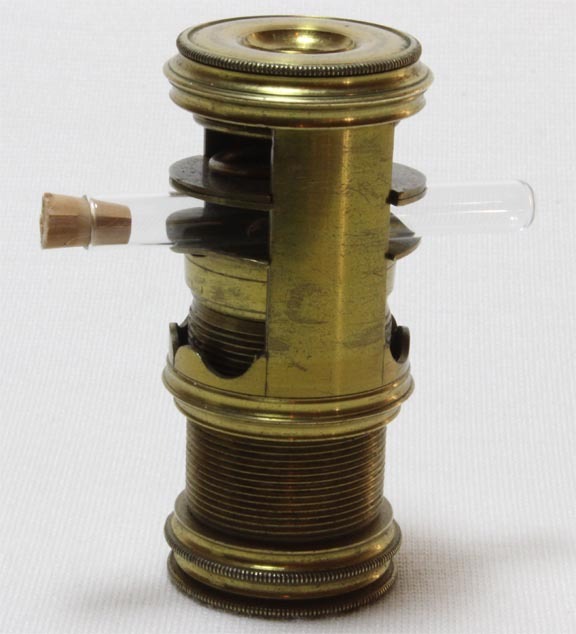 Both the Tortoni invention, and Bonanni's modification (see below) were compound microscopes. 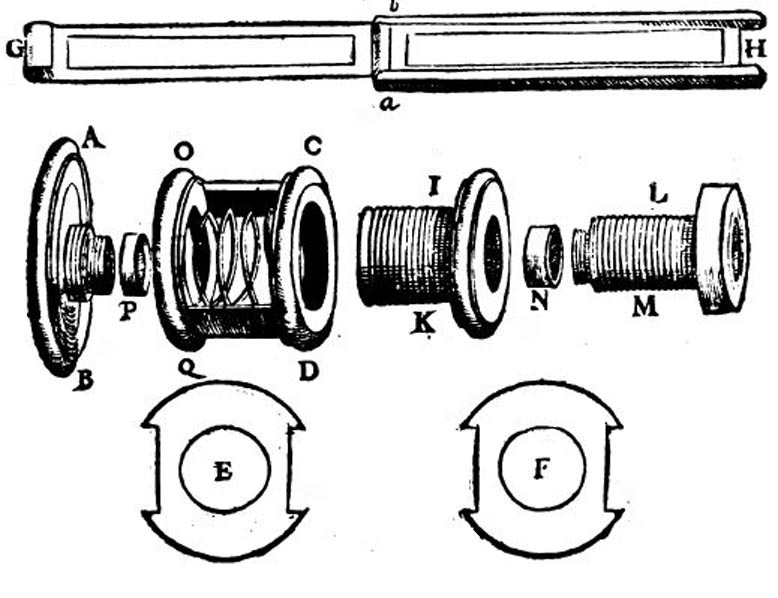 The use of a sprung stage with pressure plates can be traced back to Bonanni, who incorporated it into one of his compound screwbarrel microscopes(left) in 1691. 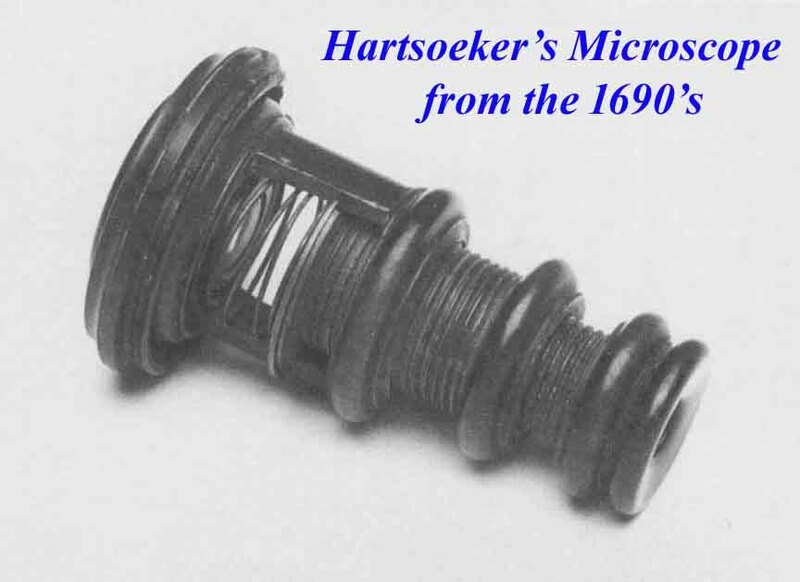 It was Nicolas Hartsoeker who, in the 1690's, first used the screwbarrel design for a simple microscope(left) and he incorporated a condenser, similar to the later model of James Wilson (about 1702,(right) and also Edmund Culpeper. Although Wilson is often credited as being the first to introduce the Screwbarrel microscope to England and his first known illustration of it dates to 1702, some examples of Culpeper's screwbarrel microscope which are signed and dated, have their signed date as early as the year 1700. Hartsoeker's condenser could be focused, using a screw mechanism separate from the focusing for the eye-lens, whereas the condenser lens in Wilson's instrument (and mine) are fixed and had to move as a unit with the stage as the stage was brought closer or further away from the eyepiece. The glass at the end of the microscope at the top of this page is plain glass and not a true condenser. Clay and Court claim that the lenses that Wilson used were superior to those of Hartsoeker. In the larger version of the Wilson Screwbarrel microscope, unlike Hartsoeker's, there is provision for a handle to be attached to the side of the barrel of the microscope, as shown in the images of Cuff's example above. The reader may note that my little screwbarrel microscope has no provision for viewing opaque objects. 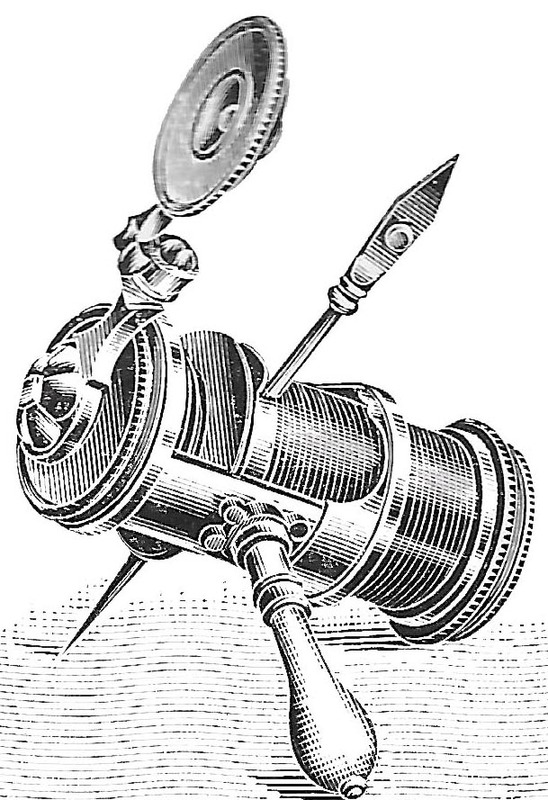 Wilson initially provided separate 'compass' microscopes for this purpose, but about 1710 he introduced an accessory for the screwbarrel for this purpose, as shown to the left. Simply, this consisted of a little arm that screwed into the end of the screwbarrel where the eyepiece would be, and the eyepiece was instead screwed to the end of this offset arm. 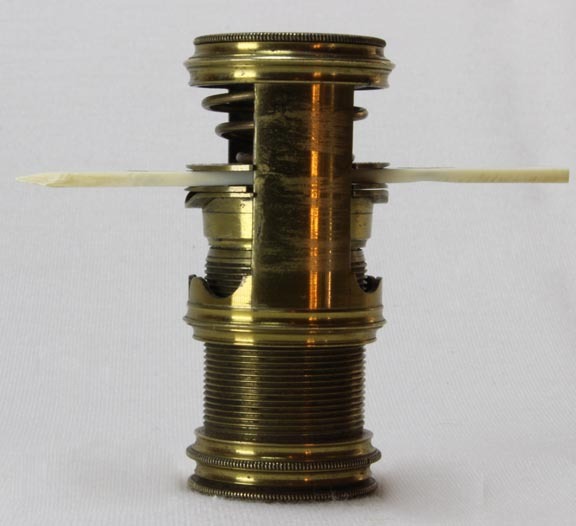 He provided a specimen holder that was inserted through the spring stage that would stick out to be positioned under the offset eyepiece, thereby allowing lighting of an opaque object from the side. Focusing was then still accomplished by turning the microscope screw. Wilson simply fit a thin spike in the groove of the screwbarrel stage, but this is not very stable. Soon after, Culpeper invented a better method that supported the forceps or black and white disk via a brass slider to which the spike was attached, carrying a forceps on one side and a disk on the other. 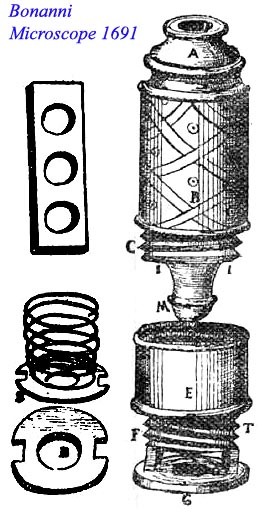 As noted above, Cuff was among the first in England to use a Lieberkuhn-equipped 'compass' microscope for opaque objects. It is generally believed he started this practice about 1738 as a result of his contact with Lieberkuhn. 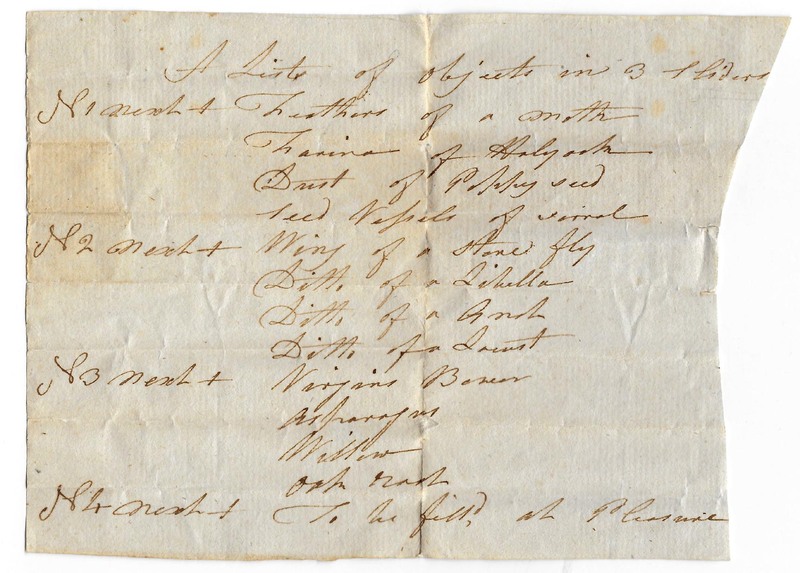 The author is grateful to Howard Lynk for help in deciphering the "old English" script on the slide list and to James Solliday and Dr. Joseph Zeligs, for helpful suggestions.